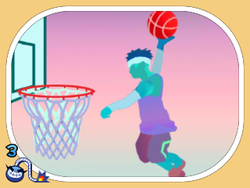 Slam Dunk is one of Jimmy T.'s microgames in WarioWare: Twisted! It later appears in WarioWare Gold, with its developer being Dr. Crygor. 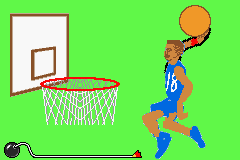 The player controls a basket-baller's hand. The game's purpose is to get the basketball into the hoop. To do so, the player has to tilt the Game Boy Advance. If he gets the ball inside, the game is won. However, if he or she misses, the game is lost. 1st level difficulty: The hoop is large. 2nd level difficulty: The hoop is smaller. 3rd level difficulty: The hoop is very small. This page was last edited on November 17, 2018, at 03:22.